Now, before I start off talking about ghost stories I feel I should make a confession – I am a complete wet-blanket when it comes to horror. Those who know me are well aware that I am petrified by anything zombie related, and anything gory or ultra-violent is completely out of the question for me. However, despite being a complete sceptic, I love and am completely fascinated by ghosts and the paranormal and always have been and I do love a good spooky chill! My grandfather started me off on this as he was a remarkable man who saw the world through very different eyes. He explained to me the true dark nature of faeries and how you should fear them and never cross or upset them, and how you should always stay alert and watch for the things that exist only out of the corner of your eye. He was a superb storyteller and I wanted more than anything to be able to emulate that. In 1976 the BBC launched a show called Rentaghost; I remember how excited I was by the title and how my mind raced with the possibilities of an employment agency for ghosts. I did watch the show (I watched everything with ghosts in) but was slightly disappointed that the makers didn’t seize the opportunity to have a really spooky show with ghosts being sent out to tackle things that the living could not. I liked my ghosts with a lot more chain-clanking and spooky jumps and in Rentaghost they were more…well…spirited! I wrote a short story in one of my many notebooks about a far more serious agency of ghosts as a means of getting the story out of my head, and then I tucked it aside and forgot about it. I continued to watch Rentaghost and loved it (despite it not really being spooky enough for me) as it was completely different from anything else I had ever seen and constantly came up with new and wonderfully crazy situations for the spectral staff of Mr Mumford’s agency. I’m still not sure how a panto horse managed to become a ghost (maybe a reader of this blog can enlighten me as to Dobbin’s origins) The series ran for a remarkable 58 episodes and continued for over eight years with Harold and Ethel Meaker taking over the agency from the second series. It was a charming and hilarious show and I have deeply fond memories it – even Mr Claypole! It had an impact on the nation too and lots more ghost stories and dramas for children followed. 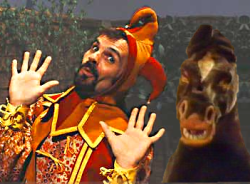 It seems that impact has lingered and now Studio Fox have bought the rights and Rentaghost is to be made into a Hollywood movie starring Ben Stiller as Fred Mumford. I wonder if he will have trouble with magical amulets that grant wishes or with the dragon in the cellar? I had not considered how important Rentaghost was to me, or the impact it had on my writing, until many decades later. Ghosts and the paranormal became hugely fashionable in the 80s, and 1980 saw the launch of the magazine The Unexplained. Suddenly the paranormal was everywhere and the public’s ghostly obsession hit the mainstream in a way not seen since the days of Edwardian spiritualism. Arthur C Clarke’s Mysterious World tv show launched later that year…and I never looked back. Now I no longer had to write those sunny stories and could indulge my passion for the world that existed out of the corner of my eye. My writing was full of life beyond death, evil faeries snatching babies, strolling spirits busy reliving past horrors, ectoplasm and macabre gothic hauntings. Decades later, and with a child of my own who loved a spooky tale, the ghostly agency returned to my thoughts. I began to write it up as new short story, but that was not nearly long enough and so it grew and grew until it became a full novel – Brotherhood of Shades – and the agency now seems nicely established. This entry was posted in Writing and tagged 1970s, funny, ghosts, Rentaghost, tv shows.